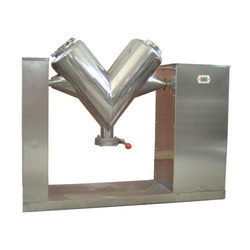 With our noteworthy set of work ethics, we have been able to come up with a wide range of SS Ribbon Blender. Our competency lies in manufacturing, trading and supplying our clients an excellent quality assortment of Ribbon Blender. - Consisting of 'U' trough of suitable dimensions. Construction of S.S. and side plates duly M.S. stiffened from outside and from inside with S.S.
- Open top with split hinged & fixed lid. 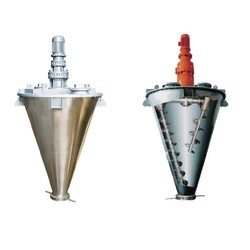 Backed by years of industry experience, we are engaged in offering a premium quality range of Double Cone Blender. - The container locking arm has a proximity switch which prevents the drive to run unless the locking arm is properly locked. Unless the container is securely locked the drive wont run.